The Coen Brothers are remaking True Grit. It’s the quintessential John Wayne film. 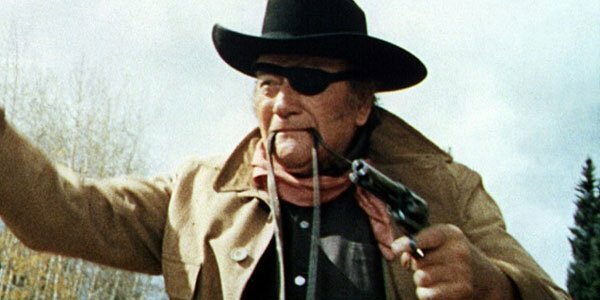 Playing the eye-patched, aging Marshall Rooster Cogburn won him an Oscar. You might think that makes it untouchable, but it’s Wayne that makes True Grit great, not the movie itself. In remaking it, the Coens are sure to make it better. I know, because in my left hand is a copy of their True Grit remake script, adapted by Joel and Ethan Coen from the original novel by Charles Portis. Set in the old West, True Grit is the story of a young girl named Mattie Ross who, after the murder of her father, hires a US Marshall named Rooster Cogburn to avenge his death by hunting down his killer in Indian territory. She accompanies Rooster and along the way they enlist the help of a Texas Ranger named LaBoeuf. In the original film, Wayne played Cogburn, Glen Campbell La Boeuf, and Kim Darby was Mattie. Except despite what this cover page claims, it’s not really adapted from the novel. Read a few pages in and you’ll recognize its true source material right away. This is a straight up remake of the 1969 John Wayne movie and what’s surprising is how little of it the Coens have changed. Where some filmmakers might take a movie like this and make radical modifications to put their own stamp on it, the Coens have taken a different approach, an if it ain’t broke don’t fix it approach. The parts of the movie which worked they’ve kept, almost exactly as they were in the original Marguerite Roberts screenplay for John Wayne’s version. The things they have changed are, quite simply, the things that needed changed. Where it’s broke they have fixed it and the result is True Grit, but even better. It starts getting better right from page one where the Coens’ version does a much better job of getting to the point than the languorous 69’ version did. The original Wayne movie takes its time on endless exposition, dragging out scenes in which we find out what happened to Mattie’s father and watch Mattie wander around town. The Coens version still accomplishes all of that but does it in a more economical manner and at the same time, gives us even more information about the characters and people involved. The best example of this involves Mattie’s first meeting with Marshall Rooster Cogburn. In the 1969 movie this happens during a long scene in which Mattie watches Rooster arrive in town, toting captured criminals. She attempts to engage him but Rooster ignores her and stomps into the jail. It’s a slow scene and one which really doesn’t give us much information about the characters. You get no sense of Rooster’s wit or even the “true grit” we’re frequently told he has. And it takes forever. In the Coens script this has been replaced with a simple scene in which Mattie stomps up to an outhouse where she’s been told Rooster is resting his laurels. She pounds on the door, they have an extremely brief but hilarious exchange in which we get a taste of Rooster’s sense of humor as well as his gruff nature. Mattie leaves frustrated and it’s on to the next scene. It’s a moment between them which could happen in under a minute, and though we don’t ever see Rooster, we learn volumes more about him than we do in the much longer scene used in the original film. That’s the best thing about the Coens’ take on the movie. It moves. It doesn’t waste time. It’s economical without being short. This is still a long, epic hunt across Indian territory it’s just one without any waste in it. They’ve cut out the waste and kept everything else, in some cases kept the original movie word for word. Fans of the 69’ version will, for instance, be delighted by Rooster Cogburn’s infamous courtroom scene which the Coens have kept intact almost word for word. Even in other places throughout the film where they’ve changed words, they’ve kept the tone and the unique, folksy mannerisms and way of speaking used by the original Rooster. These feel like the same people they were in the previous movie, and it’ll be interesting to see how they’re handled by this new group of actors which includes Jeff Bridges as Rooster, Matt Damon as the Texas Ranger La Boeuf, and Josh Brolin as the film’s villainous quarry. But the real star of True Grit, maybe even more than she was in the 69’ version, is Mattie Ross. The original film tells Mattie’s story as part of a larger whole. It’s not exactly told from her perspective or any one perspective. In the Coens version True Grit really has become the tale of a stubborn young girl. She’s the center of the story, we see everything, including Rooster, through her eyes. Nothing happens without Mattie, and even brief moments from the original film which showed things from Rooster’s perspective have been rewritten to make this more consistently her tale. The result is a much more evenly told narrative, one that seems to have something to say not just about the characters in it but the harsh nature of the old West itself, contrasted against the determination of an innocent and inexperienced young girl. And in this version, Mattie suffers. There’s never a moment when you doubt the kind of hell she’s going through to avenge her father. The original movie only really hints at it, but the Coens have made everything she goes through more real and often times brutal. And make no mistake, the wild West is entirely brutal. The original True Grit pulls no punches but this version takes it even further, refusing to flinch from the hard consequences of a hard, hard life. LaBoeuf in particular suffers from some of those consequences, but everything’s taken up a notch. The Coens compensate for that by limited LaBoeuf’s screentime. While he’s there for almost the entire ride in the 69’ version, he wanders in and out of the story here. Their goal seems to be to deepen and strengthen the relationship between Rooster and Mattie by leaving them alone in the wilderness together, even more than they were in the original film, and it works. Ultimately though, this script is so similar to the one which helped John Wayne win an Oscar that it’ll be the Coens’ unique visual and directorial style which differentiates it. What’s here on the page is a great beginning, a notch above what was already done, but its success or failure will be determined entirely by what they do on set. They’ve improved True Grit but they’ll need to find a way to leave their own imprint on it. We won’t know what that is until Jeff Bridges straps on his eyepatch and rides off into Indian territory.